Groups are available on Arena only! Sometimes, you have a set of clips that work particularly well together. You know, those two or three clips that, with just the right blend mode, melt together to become a completely new piece of content. Wouldn't it be great if you could control those clips with one fader, apply effects on them if they were one clip, and could even move them around and scale them like they were one clip? That's where groups come in. Groups are essentially little sub-compositions. You can use them to group layers together, and treat them as one big, new layer. You create a group by selecting the first layer you want to add to the group, right-clicking it and selecting Group > New. This will put the layer in the group. You will see this reflected in the interface, by the layer being slightly indented, and the newly created group will 'hug' its new baby. 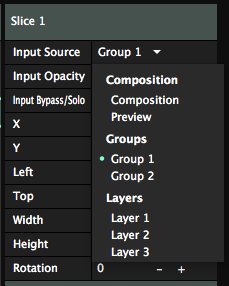 Also, the group panel will appear next to the layer panel. At this point, adding and removing layers to and from a group is very easy. You can simply drag them by the layer name handle, and either drop em in, or throw them out. Keep in mind! A group can never be empty, as this would mean the group disappears and you could lose all its effects and settings. 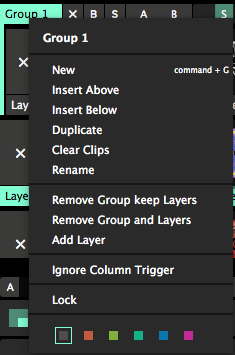 So when you drag the last layer out of the group, Resolume will create a new empty layer in its place. If you're more of a menu type of person, you can also use the layer menu to move layers out of groups. Group x - If another group is available, selecting it will move the selected layer there directly. None - This will remove the selected layer from the group. New - This will create a new group and put the selected layer in it. What Happens in the Group, Stays in the Group! Groups are a hybrid between a little sub composition and a layer. They have a lot of the same functionality that the composition has. 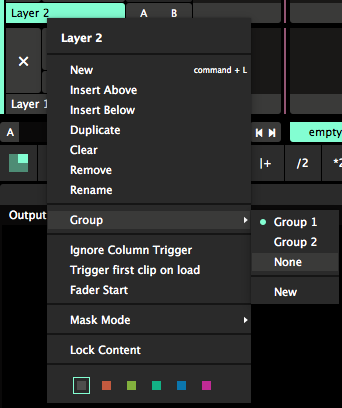 Groups have their own little column trigger, their own little master speed slider and playback controls, as well as their own master bypass, solo and eject buttons. Of course, you can apply transforms, effects and masks on the group level. Groups also borrow some functionality from layers, like Ignore Column Trigger and Lock, which are applied on all layers in that group. The only difference is that what happens in a group, never leaves that group. 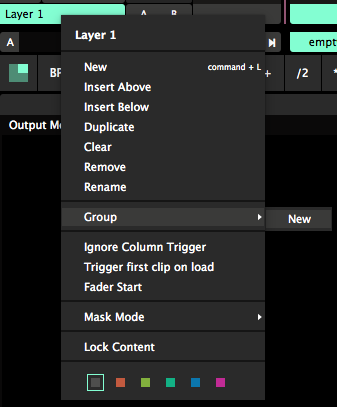 On the one hand, this means obvious things like that group column triggers won't affect layers outside the group, and pressing the group eject button, only ejects layers in the group. But it also means less obvious things. For instance, you can't route layers to a Layer Router outside the group, and you can't crossfade to a layer in a group if the group itself is on another crossfader bus. This prevents you from accidentally tearing a hole in the space time continuum. Because that's what will happen when you start doing weird things like that. And no, you can't put a group in another group. You are not Leonardo Dicaprio and you are not asleep in a van falling from a bridge in Paris. Groups start you out with a blank canvas. Regular layers will blend with the layers beneath them, depending on their blend mode and opacity. Layers in a group only blend with the other layers in the group. The first layer of a group is first rendered on a transparent black background. It doesn't blend with the layers underneath it. The other group layers are blended on top of this first group layer. The final result of this is then blended back in the composition. The group has become a single flattened layer at this point. You can use the group's blend mode and opacity to control how it's mixed with the rest of the composition. Groups default to Alpha blend mode with 100% opacity. Groups are also available as input for slices in the Advanced Output. This will let you route multiple layers to a single slice. Keep in mind that you can no longer use the group blending mode at this point. Also, routing a group to a slice means you bypass all composition effects.